Well this is the seventh post which means we are halfway done! Yay! This also means only seven days ’til Valentine’s Day, so if you haven’t picked anything up for your loved one, ya might want to start thinking ’bout it. 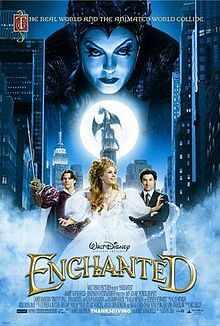 Enchanted was such an awesome movie. All the characters are really great, the storyline is amazing, the songs are perfection, and all the disney references magical. I love this movie, and am proud to have it be the halfway mark. So Giselle (Amy Adams) is sent to the real world by the evil queen (Susan Sarandon), who doesn’t want her to marry her stepson, Prince Edward (James Marsden <3), and take her place. She is found by Robert Phillips (Patrick Dempsey) and his daughter who take her in. Robert is a divorce lawyer, (and divorced himself), who doesn’t believe in true love, fairy tales, etc; pretty much anything romantic is nonsense. A super realist. Robert has been dating his girlfriend Nancy for like five years, and no hint of proposing and he’s never done anything romantic for her. Robert is the girl in this scenario. So Nancy misunderstands what is happening between Robert and Giselle; and Giselle tries to patch everything up. She finds out that they are having a King and Queens Ball that weekend, and thinks it will be the perfect present for Nancy. However Robert isn’t really into that. 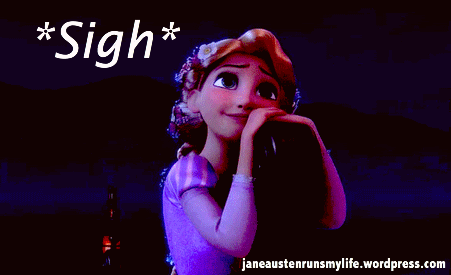 “Giselle: [singing] Well, does he take you out dancing just so he can hold you close? Robert: [speaking] I don’t dance! But Giselle sends the tickets off with lovebirds and flowers to Nancy so Robert and Nancy can fix everything and get back together. But things are changing between Giselle and Robert. Robert is starting to relax and realize that he doesn’t need to be serious and bitter all the time. Being with Giselle is changing him, he’s letting down all the walls he created to keep himself from being hurt again. Giselle is also growing; she is becoming more sure of herself, independent, etc. When Prince Edward finds her and is ready to take her back to Andalasia, she doesn’t quite want to go. She has started to like living in the “real world” rather than the “fairy tale”. She and Edward go on a date, and the last thing she wants to do before going back is the King and Queen’s ball. Now here is the romantic part. At the ball, they announce a dance that one must do with someone that is not their date. As Prince Edward doesn’t know anyone, he asks Nancy to dance, and then Robert asks Giselle. He’s dancing with her! He hates to dance, but when the two dance they just gaze at each other in complete adoration. And if that’s not romantic enough, he sings to her. SINGS! You just see in that moment how much they love each other! 😀 You just see how the two being out the best in each other! The only thing I don’t like is Giselle’s dress. I know it is supposed to signify her compete transformation and acceptance of “our world”, but it is not a very good color on her and flattens her out. I love Robert’s outfit though. They are supposed to be making an Enchanted 2, but it looks like it has been a while since they last updated their info. If interested here’s some info. This entry was posted in Disney, Fairy Tales, Romance is in the Air and tagged Amy Adams, Andalasia, Ball, Dancing, Disney, Divorce Lawyer, Divorced, Enchanted, Evil Queen, Fairy Tales, Flowers, Giselle, James Marsden, King and Queen's Ball, Love Misunderstandings, Lovebirds, Patrick Dempsey, Prince Edward, Realist, Robert Phillips, Romantic, Singing, Single Father, Susan Sarandon, Valentine's Day.